William Walker Allen, of Inner Street, enlisted in the Army as an 18-year old mysteriously he was discharged six months later as unfit for military service. He gained employment at Richard Hornsby’s Spittlegate Ironworks. 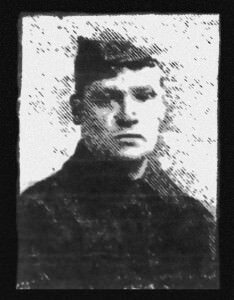 Then in August 1914 he enlisted again, this time as a Special Reservist, leaving a wife and three young children behind. The 8th Lincolns, of which he was a part, were thrown in at the deep end at the Battle of Loos, 25 September 1915. They had never been in action before and were thoroughly beaten by a much more experienced foe. Of the 1,023 men who landed in France on 10th September, at the roll call was made on 29th September, just 530 answered the call. This was a very dark day for the British Army, the Lincolnshire Regiment and most importantly their families. But Bill Allen (to those that knew him) luckily survived to fight another day. The next significant action he was involved in was the Battle of the Somme. The 8th Lincolns were in the second wave of assaulting troops on the 1 July. The 8th Lincolns attached in the vicinity of Fricourt as part of the 21st Division. They did well and reached and held their first line objectives. However given the number of casualties the Lincolns took they were soon withdrawn from the line to refit and re-organise. As the battle dragged on they found themselves again in the front line this time at Beaucourt which the Royal Naval Division had recently captured. The Germans retaliated with a huge bombardment and Pte Allen was wounded in the neck by shrapnel and had to return home for surgery. Fortunately there wasn’t any lasting impediment. Returning the front this time with the 7th Lincolns he saw action helping to beat off German counterattack following the Second Battle of the Scrape. Shortly afterwards he was posted to the 2/5th Lincolns, a second line territorial unit. They took part in 3rd Ypres in the vicinity of Langemarck and achieved their objectives. In the spring of 1918 the Germans launched Kaiserschlacht and the 2/5th Lincolns were caught in the teeth of the maelstrom. The line was smashed by the ferocious onslaught. The Battalion lost 20 officers and approximately 500 men. They moved to Flanders to refit, receive replacements and reorganise when the Battalion was hit again, as the Germans switched their point of attack. This time the 2/5th Lincolns were reduced a cadre of just 80 men. The Battalion, Brigade and Division to which he belonged were disbanded and the survivors transferred to other units. The remnants of the 2/5th Lincolns were all posted to the 1st Lincolns. Following the Battalion of Amiens in August 1918 the British Army continued its advanced in what is known as the 100 days. During an attack Pte Allen was taken a Prison of War. Thankfully he was returned safely home to his wife and daughters. Some 22 years later he was to take up arms again as part of the Home Guard. He died in 1956, and is buried in Grantham Cemetery. William Allen lived at 3 Union Court with his wife Martha, daughter Ethel May and would have known and played with my great uncle William Hardy who lived at No.2 Union Court.He also served with the 7th Battalion ,Lincolnshire Regiment but was killed on 8th August 1916 aged 27.The 2nd battle of the scarpe was the Battle of Arras April 1917.Vaughan Hardy.